Guardians of the Galaxy, Vol. 1. Awesome Mix. Ain't no mountain high enough (Marvin Gaye and Tammi Terrell). 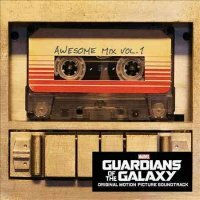 Terrific submitted by semartin on June 22, 2015, 8:31am Great soundtrack even if you haven't seen the movie, but enjoy classic rock. An awesome mix submitted by manz on June 30, 2017, 1:18pm Of songs you wanna hear! Great for riding in the car. Even if you haven't seen the movie and don't care about the Guardians. Fun to listen to submitted by anacoluthon on August 25, 2018, 2:17am This is a great collection of late 60s-70s classics that really set the tone for the movie. Description: 1 audio disc (44 min., 57 sec. ) ; 4 3/4 in.